If you have ever wanted to try sailing, or you are wondering if you would like to join our club, then this is your chance to come and sample our hospitality and facilities, and to get out on the water for a first hand experience. If you do decide to join there is a special offer on our membership fees just for the day. All visitors are welcome and we will have club tours available on demand for anyone who’d like to be shown round our facilities. Galley refreshments will be available all day, and the bar will be open. After a short introduction, you will spend a total of about an hour on the water with one of our experienced sailors, who will show you which ropes to pull and even let you have a go at steering. Your ticket entitles you to free tea and a snack. 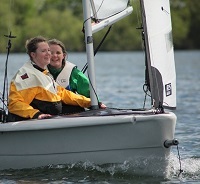 Children can go sailing with their parents or they can opt for a taster in one of our boats specifically for children only. These sessions will be in the afternoon.